The Truck – Why this one? There are many powerful and durable trucks in the world. I had to wade through so many models and options to come to this decision. I have experience with a few U.S. made trucks and utility vehicles as well as the HWMMV, Mercedes G-Wagon (military variant), and various makes of Toyota. While all of these companies make some pretty amazing trucks, and there are a variety of opinions as to which is best, I steered away from the “cool factor” and wrote down my needs as I could see them. I wanted a tough, large, powerful, four-door truck with enclosed storage space that was accessible from inside the vehicle. I also wanted a truck with a reliable mechanical history, a wide availability of parts, and which had a good, collective, world knowledge-base supporting it. After reading many opinions, reviews, traveling overland through Botswana, crossing Kuwait and Iraq in a G-Wagon and a HWMMV, and talking to several 4X4 mechanics it seems the only sensible answer to the “which vehicle” question is the Toyota Land Cruiser 80-Series, specifically the models made between 1995-1998. Besides the linked article, which I found after beginning research on the 80, it was the comments from the South African I met up with that put me on this path. They were all very experienced overlanders, having previously owned safari companies and 4X4 shops. There were a variety of vehicles present around the camp, but the discussion always turned back to the 80-Series. It is the last high end model that has minimal or no electronics, a direct injection engine, solid front and rear axles, and very tough gear boxes. They also come standard with manual lockers and have the most reliable history any of them could think of. They all swore they’d trade there 100-series if offered one, but that they were to expensive and too hard to come by in South Africa. By too hard to come by I mean, no one will sell them and f they do it’s very expensive, and most of the SA versions have the 1HZ engine and no turbos. While praise was given for the Land Rover, it was consistently followed by “You have to love them and you have to love working on them.” I enjoy doing mechanical work, but on a trip that can stretch from 17,000 to 40,000 miles, I wanted to get something that would run reliably with minimal maintenance. I’m not going to blanket statement this, though. 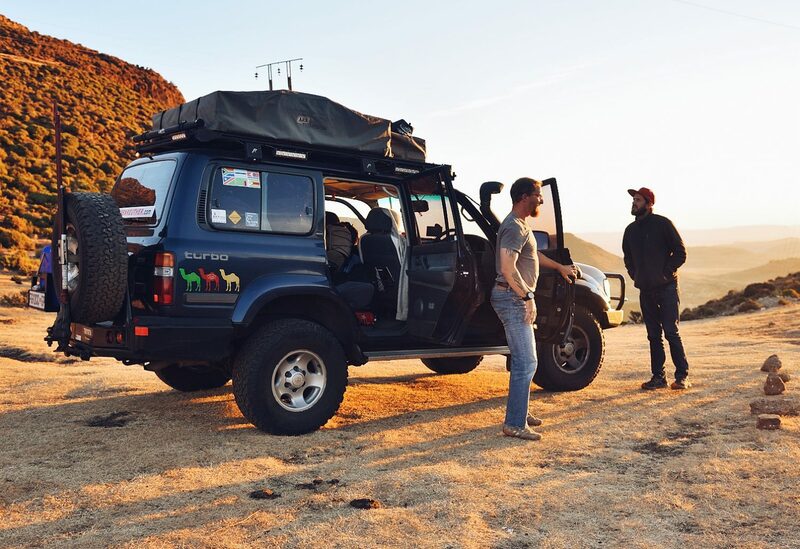 Many people have crossed Africa in Land Rovers, many in Land Cruisers, but people have used and continue to use other trucks as well. I think I was finally sold by the mystique and what I read about mechanical reliability. Not an 80, but still a Land Cruiser!